You are here: HomenextPeoplenextPlayer ProfilesnextSmith, Frank "Tinker"
Frank Smith was born in 1887 in Gloucester, and lived in Kingsholm as a boy. His father was in the match trade. By the time he was 14, Frank was a newspaper seller, and went on to work for the Citizen for many years. He first played rugby for St Marks, and progressed to the Gloucester 2nd XV during the 1904-05 season. He made his debut for the 1st XV in the penultimate game of the following season against Northampton at Kingsholm on 16th April 1906 and scored a try in the 20-6 victory. He retained his place for the final game a week later at Bath, and his try was the only score in the 3-0 win. Frank won that first cap for Gloucestershire against Cornwall at Kingsholm on 5th January 1907 in the last County game of the season, and he had to wait until 26th February 1908 for his second against Devon. He was brought back into the County side in the middle of the 1908-09 season and won successive caps against Devon and Somerset, scoring a try in each game before being selected to play for the County against Racing Club de France at Kingsholm on 24th December 1908, when he had the distinction of scoring a hat trick of tries in the 39-0 victory. He made two further appearances against Devon, his final game coming on 6th November 1909, which gave him his seventh cap. 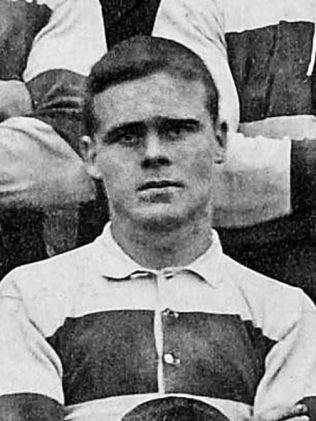 In 1908-09, Frank played the whole season with Gloucester, and again topped the list of try-scorers for the second time with 18 tries from 31 appearances. The Citizen reported that he “retained his place on the right wing, and in attack was as smart as any player in the County; his defence however left something to be desired”. Frank played quite regularly for the first half of the 1909-10 season, making 16 appearances and scoring nine tries, including two in the 9-5 victory over Abertillery at Kingsholm on Christmas Day 1909, but these proved to be his last tries for the Club, and he thereafter dropped out of the team. In 1910 Frank joined the Gloucestershire Regiment and served with them until just before the war. However, he returned to play one final match on against Cinderford on 3rd October 1910, doubtless for sentimental reasons given his association with both clubs. He finished his career with 95 appearances, 53 tries, and one dropped goal. Shortly before the Great War, he left the Army and was employed at a jam and pickle factory, but, as a Reservist, he was called up at the outbreak of war to serve as a Lance Corporal (8310) with 1st Battalion, Gloucestershire Regiment. He landed in France on 13 August 1914 and fought in the early battles at Mons and Ypres in 1914 and was wounded twice. Whilst recovering from his injuries, he married Cecilia Annie Barnes at Stroud in 1915. He sailed for Gallipoli later in the year, was evacuated to Egypt, and was promoted to Sergeant before being transferred to Mespotamia, where he was killed in action on 21st April 1916.